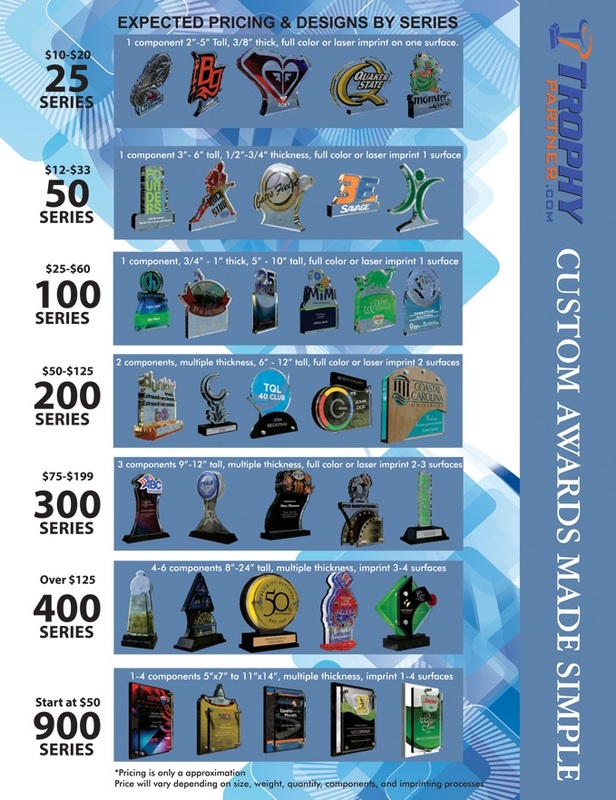 Custom Trophies 400 Series. 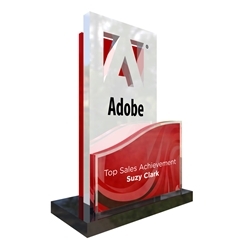 These awards feature 3-6 components, multiple thickness and range from 10" to 24" in height with multiple thicknesses. They include a full color or laser imprint on three or more surfaces. Prices vary based on final design, quantity, and height but generally range from $125 - $250 each for an order of 2 pieces or more. $400 minimum order required. We can achieve a price point per piece based on changing the complexity, size and thickness of the award. These eye appealing awards make the perfect awards or gifts for anyone! We can create virtually anything!!! Let your creative imagination run free. Once we get your information we will put together a free design or two with no obligation to purchase and email that to you. Tweak the design until we have created the perfect award for you.